As Absolom flees, his hair is caught in the branches and he’s left hanging. SAUL, HAVING BEENdefeated and severely wounded in his last battle with the Philistines, killed himself for fear of falling alive into the hands of the enemy. After his death the tribe of Judah chose David for their king, and he reigned in Hebron between seven and eight years. At the end of that time he became king over the whole Israel; and, having taken Jerusalem from the Jebusites, who had got possession of it, he made it his capital city, and lived there in a fine palace which he built for himself. He greatly desired also to build a temple, in which the ark of God might be place, and in which God might be worshiped with more splendor than He had been in the Tabernacle. God was pleased that David desired to do this, but told him that not he, but his son Solomon, who was to succeed him, should build the Temple. David had many children, and among these his son Absalom was his favorite. He was very beautiful, and not only his father, but all the people of Israel, loved him. But he was a vain, worthless young man, and caused his father much sorrow by his wicked conduct. He murdered one of his half brothers; and then, when, after long banishment, he was permitted to come again into the king’s presence, he very soon raised a rebellion against him, in order to seize the crown for himself; and such numbers of the people joined with him that David was obliged to make his escape from Jerusalem into the wilderness. The good king was sorely grieved that his own favorite son should seek his life; but he trusted that God, who had so often delivered him, would do so now. He soon drew round him forces enough to meet those of his rebellious son, and a pitched battle was fought between them in the wood of Ephraim. 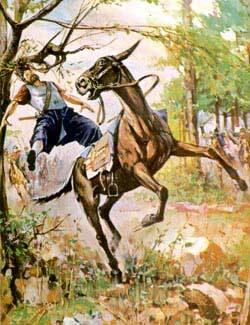 The troops of Absalom were defeated with great slaughter; and as he himself was flying from the field of battle, his mule carried him under a large oak-tree; his hair caught in the branches, and the animal, galloping off, left him hanging there. One of David’s army, who saw this, instead of releasing him, ran and told Joab, David’s chief captain, who, though he had received a strict charge from the king to save the life of his son, hastened to him, and cruelly killed him by thrusting three darts through his very heart.